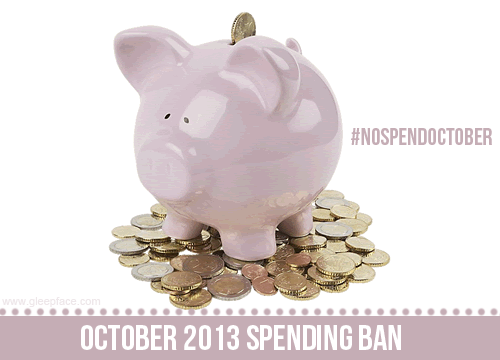 So a lot of us have done spending bans before, and it’s certainly not a new concept by any means. But I have been in a bad way financially for many years now, and I have a bit of a different reason for wanting to do a spending ban. I am pretty convinced that my spending is already very minimal, and I want to take the month of October to do an experiment. Am I really as thrifty as I make myself believe, or am I just kidding myself? I’ve decided to use the month of October to keep an eye on my spending in a more structured way, and I think it would be awesome if you guys joined in. This could be motivation, tips, ‘shopping my stash’ posts/videos (I am defintely going to be doing at least a few of these myself) or just anything you feel is relevant. I’ve tried to make my rules realistic, I’m not going to become a hermit and make myself miserable, but I am going to keep a conscious eye on how much money I spend through out the month, and see by the end of the month how greatly this differs from my normal spending habits! Let me know if you’re going to join in the comments, and spread the word! I’d love it if I had a few people to do it with me by October the 1st! Hey, I love this and have been thinking about doing this for the last few months as well. I will totally share this and your idea on my blog, and I think I will come up with my own list for "allowed". Great Idea. i would totally love to do this! my birthdays in october though…. i'd totally cave! Awesome idea! Wish I had the discipline to do the same, maybe I'll try this next month. Goodluck! !